Mike Youngblood Williams fought for the last time in his career on this day in 1981, losing by 6th round TKO to Joe Tiberi at the Martin Luther King Arena (formerly called the Arena). 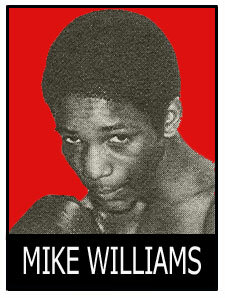 Williams, once a promising young Philly welterweight, never really panned out as legitimate prospect. He started his career in 1973 and by the end of 1976 had reeled off 14 straight victories (7 by KO). This streak brought him into a bout with Alfonso Hayman on June 27, 1977. The two young Philly welterweights staged a gory, glorious war at the Spectrum. After 10 tough rounds, the fight was declared a draw. The natural and hotly anticipated rematch was scheduled as the semi-windup for Saad Muhammad vs. Kates in 1978. But Williams pulled out of the fight due to an auto accident that badly scarred his face. The rematch never happened. Williams fought just two more times, including the loss to Tiberi.